CHARLOTTE, N.C. -- Well, Matt Kenseth did say he wasn't retiring. After stepping away from full-time competition at the end of 2017, the 2003 NASCAR Cup Series champion announced he is returning to the series on a part-time basis with Roush Fenway Racing start May 12 at Kansas Speedway. Kenseth was introduced by long-time friend and former teammate Mark Martin at the NASCAR Hall of Fame Wednesday. "It's a great feeling to return to where it all started for me in the Cup Series," said Kenseth. "There aren't many people who have been more influential in my racing career than Jack Roush and Mark Martin. For them to believe in me today means almost as much as it did when they believed in me the first time, 20 years ago. I'm excited to get to the shop, get back to work, and help Roush Fenway return to prominence in the NASCAR Cup Series. The team also announced that Wyndham Rewards has signed on for a multi-year partnership of the No. 6 Ford. Kenseth will split time in the car with Trevor Bayne throughout the remainder of 2018. Kenseth's exact schedule for this season is still being worked out, Roush Fenway announced. The 46-year-old lost his ride behind the wheel of Joe Gibbs Racing's No. 20 in favor of next-generation talent Erik Jones, who transitioned over the top Toyota team after spending his rookie season with satellite team Furniture Row Racing. 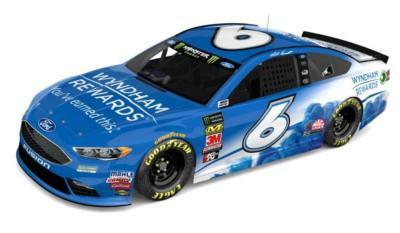 "We are very pleased to welcome Matt back to Roush Fenway," said team co-owner Jack Roush. "Matt is one of the guys who really put us on the map of the racing landscape. He's one of the most talented drivers to ever sit inside a race car and his will to win, drive and determination have always embodied what we strive for as an organization. Last November, Kenseth told NBC Sports' Nate Ryan that he decided he would step aside to spend more time with his family before considering a return to racing. "I don't know what that means," Kenseth said. "I don't know if that's forever. I don't know if that's a month or I don't know if that's five months. I don't know if that's two years. Most likely when you're gone, you don't get the opportunity again. I just don't really feel like it's in the cards." In 471 career starts with Roush Fenway, Kenseth earned 24 victories, including two Daytona 500s (2009, 2012) and the organization's first championship in what is now the Monster Energy NASCAR Cup Series.